The JioPhone is currently available on Mumbai, Bangalore, Hyderabad, Pune and kolkata as per sources. The Jio feature phone comes with 2.4-inch QVGA display where the Jio Tv app is already pre-loaded. That means you can also enjoy the Jio Tv on this phone. The JioPhone is capable of resolution720p videos, so if you have a television capable of rendering videos in 720p, you will be able to view content in HD. Jio cable TV adapter is a device by which user can stream all Jio Phone content to big Tv screen. Then the company has launched this Jio cable TV adapter so that we can enjoy the videos on the large screen. The Jio TV Cable adapter comes with its own power source and is capable of charging the JioPhone while it is connected for video playback on a television. The Jio Phone TV Cable comes with two variant adapters, one is RCA Adapter and another is HDMI adapter. User can using CRT TVs will need to buy the adapter with an RCA out, while have a LED or LCD TV with an HDMI port will need to buy the other version.Videos appear in a 4:3 aspect ratio on CRT TVs and 16:9 aspect ratio on HD TVs when transmitted from the JioPhone to a TV screen. The adapter attaches to the microUSB slot on the JioPhone at one end, and a USB or HDMI port on the Jio TV Cable adapter at the other end. First of all, buy JioPhone. After that, recharge with rupees 309 package. Now you can enjoy the Cable TV Adapter features. 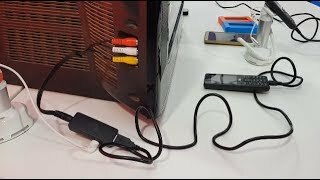 Connect your JioPhone to the TV Cable adapter. It has an HDMI and RCA port on the device, connect the port to your TV. After that, click on Jio TV app and enjoy the video on the large screen. So Both Old and Smart TV can be connected by this cable. It is a separate device of JioPhone. The device will not come with the mobile in the accessories box.